Contact can be made via tony.jasper@btinternet.com. Copy is welcome, but there is no payment. Material should fit in with the broad nature of this magazine. Full credits will be given. Reviews of films, television, and book are most welcome. Copy on charitable concerns is welcome but proof of the genuine nature of material is needed. THIS MONTH welcome a great friend of mine Linda Slade – someone who manages to call in on many aspects of theatre and drama. Linda Slade trained in Voice at The Royal Central School of Speech and Drama in London. She has been teaching voice internationally for over 25 years and has worked with some of the world’s best actors including two Oscar Nominated Actors and One Bafta Winner. 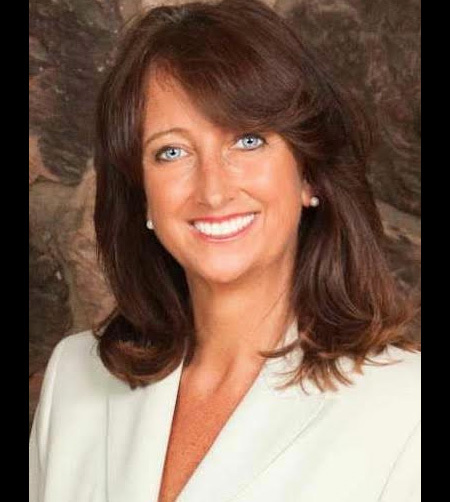 Linda has also been a Vocal and Dialect Coach for Lifetime Films USA and the BBC and has coached and supported numerous politicians in preparation of their speeches. She has taught at Cal State Fullerton , The New York Film Academy at Universal Studios , Fresno City College , Berlin University and most of the top British Drama Schools. Linda, as well as having been a voice coach, has also worked as an actress, voice over artist, director and television host and has worked in radio and theatre, film and television, voice over and business presentations. She has presented her voice workshops worldwide and coaches private individuals and groups. Linda studied acting and directing in her Bachelors Degree at Cambridge University , England. She later trained in Movement at Lambeth College in London and Acting at The Drama Studio London. Finally, she combined her early work with the study of voice at The Central School of Speech and Drama, which led to her work as a voice and movement specialist. Most recently she graduated from The University of Santa Monica in California with a Masters Degree in Spiritual Psychology and Consciousness, Health and Healing. Since then she has focused on work that helps to identify and release the underlying psychological causes of vocal repression and inhibition in order to free the client and the voice. 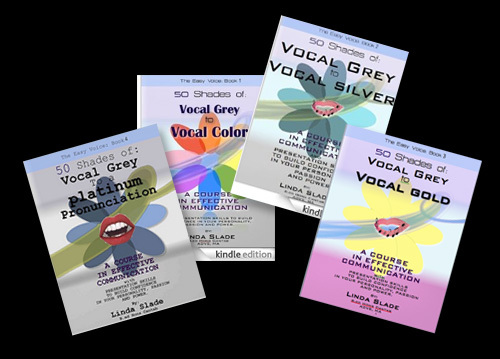 Linda has written six books on voice in total, Vocal Grey to Vocal Color , Vocal Grey to Vocal Silver , Vocal Grey to Vocal Gold, Vocal Grey to A Platinum Pronunciation, Vocal Grey to a Crystal Communication and Vocal Grey to a Diamond Delivery. These books form a series that address vocal issues and provide techniques for readers, through developmental exercises, that will support them in finding their authentic sound, help them release blocks that restrict free vocal delivery and enrich their understanding of some of the basic requirements for delivering a powerful and effective presentation or speech. Do you often feel frustrated when the voice you hear in your head is not the voice that comes out of your mouth? Do you feel vocally blocked and intimidated? Do you find yourself stammering in public or losing your confidence and voice when you have to speak? Are you being called to talk in public in order to promote your business but are afraid? You may already be a confident speaker but want to improve. You may be a complete novice who is terrified of speaking in public and wants to overcome that. When I refer to speaking in public I am not just referring to the professional who has to stand up to talk in front of a hundred people at a conference, I am also referring to the parent who has to speak at a parent’s association for the local school, the neighbor who has suddenly been called on to represent the community on a local issue, or the best friend who is asked to speak at a wedding or funeral. There are also more intimate reasons to communicate clearly with friends, families or lovers. In all of the above situations your voice communicates much about you and it makes an important contribution to how you are received by other people. It is likely that at some time or other in your life you will be asked to speak in front of others. If you want to improve your communication skills, make a better impression on someone you would like to be closer to, or overcome a fear that is restricting your ability to speak in public, these books are for you. I've been teaching voice for over 25 years. My work has taken me to exotic locations on film sets, professional business seminars, theaters, schools and universities. I have studied and worked with my own voice in performance, singing, voice-over and animation and have worked privately with Oscar winners, politicians and business professionals. I started my journey by learning how to overcome my own fears of standing up in front of others and communicating and I still practice these exercises to keep my voice strong. Voice is a muscle and it needs exercise just like any other muscle in the body. If you don’t practice the voice will diminish in its power. You have to work the voice regularly to maintain your confidence and strength. Use it and improve it! In this easy read I will give you simple and practical exercises that you can use daily in the security of your own home. These exercises will not only strengthen your voice but will integrate the authentic part of you with your voice. Ultimately, with practice, you will find that you are better able to express yourself and communicate with truth, confidence and clarity. Fifty Shades: From Vocal Grey to a Platinum Pronunciation offers you the choice of many exercises. If you practice them, these exercises will give you greater appeal, confidence and the ability to interest the listener in what you desire to communicate. It will enable you to relax and speak your truth without fear of judgment or vocal let down. Your voice is there to support you. I’ve seen these exercises benefit many of my clients. Let the beauty of who you are communicate through a vocally strong and articulate voice. Feel the joy of sharing the magnificence of who you are with others. These books address both the psychological and physiological aspects of vocal production. Issues in both of these areas can so often hinder our confidence. There are ways to clear the psychological blocks and settle back into the natural voice you were born with, and vocal exercises to strengthen it for public communication. In my books you will learn how to release tensions in the body that inhibit the resonant vocal sound that is your true voice. You will develop skills in strengthening your voice and supporting your voice, and you will develop your articulation. As you free the voice from blocks and inhibitions you may reveal hidden mis-beliefs about yourself and your identity and in releasing these you will free yourself to communicate from your heart. You will discover a ‘you’, that revels in true vocal freedom: a ‘you’ that rejoices in the power and confidence that comes with a resonant voice, and a ‘you’ that is excited to stand up and share your message in public. You will want to communicate and be heard! How can anyone not love the debut album from 3 Winans Brothers, Foreign Land (BMG Absolute).? Well perhaps not if you are a metal trash fan, or someone whose ears never stray from the classical. Certainly for anyone who loves soul and gospel , and even dance, this is manna from heaven. In the US this album set has already won various awards and excited record reviewers. The Winans is a US family set-up that has carved its name into US Gospel Music history, but here comes the first from the three bothers Carvin, Marvin and arguably the best known Bebe Williams. Bebe has in past times made some beautiful albums with sister Ce Ce. This album has a veritable mix of musical styles, from rasping house to smooth riding soul to a mix that even briefly transports you to the Bee Gees., and of course Gospel Music in its present contemporary music phase. Well, there is house sampling vocals, and a gospel choir along the way, but of course some fine singing from the trio shines through, all aided by catchy accompaniments very much to the fore. To these ears this is a mix of the smooth riding vocals and arrangements that was once given the title of “Philly’ to the raw guts of present house dance. The best illustration of this is the catchy opening cut with its funk house edit, and where the title is an appropriate ‘Dance’. The sharp girl sample lead and ace girl back-ups steal the show from the guys. It’s a track for the floor or designed for a pushy loud car radio sound from a large convertible riding the wide US street. As it happen the femme vocals come from the fabulous Clark Sisters. In the US they call this ‘feel good music.” It is also filed under Soulful House Music. Lovely falsetto guy singing comes on the second track ‘Your Love Will Never End’ that takes us through the glories of creation and personal assurance of love. It has a hit riff title line and with the trio comes a gospelling - pop choir – all very fetching. The choir “Coo” us into a song to some extent based on Romans 8, with its title ‘If God Be For US.” You have to wait until track six for the title track, a smooth sounding affair with close-up exquisite vocals. Lyrically it is about a battle within the mind, of attending to the Word of God, of waiting for Christ’s return. They yearn for that ‘home’ of the after-life where there are no tears or fears, and take as you will they would have us accept our present existence as “foreign land” Ideally this album should be out there pushing the narrow confines of BBC Radio One into black music par excellence for how much soul, let alone Gospel does the station mix into his mainstream programming? – The answer is little. ‘Please Don’t Let Go’ is another smooth riding cut that would sound great pumping through the car windows on a warm summer night – in the US at least. It also has some good sounding sax before the velvet sounding vocals once more take over. By this point we are hitting 40 minutes on this engaging album and if you want to know how three guys singing can have variety, even the unusual, take in track 11, ‘Just Between Me and you.’ that also has some sensitive and lovely piano to vary instrumentation. Brother Carvin believes that when God gives you a gift, you has to nurture that gift, practice and exercise your vocal cords.” Brother Bebe says their father gave them good advice when setting out.“ Know who you are before people in the world tell you who you are. So if your record is successful you’re not easily persuaded to go another route.” Brother Marvin says the album take us through some of their life journeying. Oh, ‘Dance’ gets two outings, there on track two and again at 13. So there is a double helping of ‘I Really Miss You” with the second a soul remix. And ‘Move to Me’ is also given a double outing with the second a fiery trumpet funk led feel. And indeed some groove hit vocal back-ups to the lead, as it steams away fast and furious. It fades out at 3”26 but could have been easily extended to really hit the dance floor. Great stuff but then the album is a mighty affair. Play it loud! THESE CDS FIND THEIR WAY INTO the Jasper library but vinyl albums are not listed. FACES THE BEST OF good boys. RED HOT CHILLI FINGERS WHAT HITS? TEN YEARS AFTER see Albert Lee. These sketches by tony jasper can be presented but recognition of the writer should be given. VOICE A FEW WEEKS AGO NEWS BROKE THAT THE POLICE may focus on cyber crime, terrorisms and protecting children, and not have time to investigate such a mundane thing as someone reporting they’ve been burgled. We have had access to one phone call from a Mrs Daisy Plant. MRS PLANT: HELLO. AM I THROUGH? IS THAT THE POLICE STATION? MRS PLANT: MY NAME IS MRS PLANT I need help. OFFICER: CONTINUE MADAME IF YOU WANT ASSISTANCE. I CAN SAY THIS IS NOT THE RAC AA OR GREEN SHIELD. I CANNOT SAY MORE. MRS PLANT. MY NAME IS MRS PLANT. OFFICER THANK YOU FOR THAT INFORMATION AND FOR USING OUR SERVICE MRS PLANT. EVERY CALL IS VALUABLE. WHAT CAN WE DO FOR YOU ONTHIS LOVELY DAY? MRS PLANT:I AM 82 AND I AM BEING BURGLED. OFFICER; I AM SORRY TO HEAR THAT. MRS PLANT I NEED HELP. OFFICER ; THAT SEEMS A REASONABLE THING TO SAY IN VIEW OF WHAT YOU REPORT.. PLEASE BE ASSURED THAT YOUR CALL IS BEING RECORDED AND MONITORED FOR FUTURE TRAIING PURPOSES.. SO WHAT CAN WE DO FOR YOU? MRS PLANT: YOU ARE THE POLICE? OFFICER; I AM WILLING TO SAY THIS IS NOT THE AA OR RAC BUT I RESERVE THE RIGHT NOT TO SAY WHETHER THIS IS GREEN SHIELD OR NOT GREEN SHIELD. MRS PLANT YOU MUST KNOW. OFFICER I HAVE TO KNOW WHAT BRINGS YOU TO THIS CALL BEFORE I CAN DEFINITELY SAY. MRS PLANT :I AM BEING BURGLED AT THIS VERY MOMENT. I AM HIDING IN THE BATHROOM. OFFICER: I AM IMPRESSED YOU HAVE A SIGNAL. IN VIEW OF YOUR DESCRIBED SITUATION YOUR LOCATION SEEMS A REASONABLE. CHOICE. MRS PLANT: YES, BUT. I AM BEING BURGLED. OFFICER: UNFORTUNATELY YOU CANNOT MAKE A CUP OF TEA. BUT TO BE POSITIVE AND PRO-ACTIVE WHICH IS VERY IMPORTANT WHEN UNDER STRESS, IF YOU ARE TAKEN SHORT YOU ARE IN THE RIGHT PLACE. OFFICER”: IN VIEW OF WHAT YOU SAY I AM WILLING TO SAY WE ARE THE POLICE. MRS PLANT: I AM BEING BURGLED. TIME IS MARCHING ON. OFFICER: I AM SORRY TO HEAR OF THIS INCONVENIENCE,. I WOULD LIKE TO FFER YOU OR MORAL SUPPORT, AND FOR SOME OFFICERS HERE, A PRAYER SUPPORT. MRS PLANT: ARE YOU SENDING SOME 0FFICERS? MRS PLANT : I DON’T UNDERSTAND. PREMISEWILL SOMEONE COME? TO OUR EMERGENC DESK. THEY WILL HELP YOU. PLEASE HOLD THE LINE. THERE MAY BE A PAUSE. VOICE: THANK YOU FOR CHOOSING THIS UNDISCLOSED SOURCE TO DEAL WITH YOUR PROBLEM. QUESTIONS WTH A YES OR NO. VOCE PLEASE ANSWER YES OR NO. AFTER ASWERING ALWAYS PRESS THE HASH TAG. VOICE THANK YOU. ARE YOU A VICTIM OF TERRORISM? YOU Have 5 seconds remaining. VOICE THANK YOU, ARE YOU PROTECTING CHILDREN FROM NASTY PEOPLE ? MRS PLANT I am being burgled. VOIC E PLEASE ANSWER YES OR NO. OFFICER; I AM PLEASED TO SAY YOU ARE NOT A VICTIM OF MAJOR CRIME THAT COULD HAVE INTERNATIONAL SIGNIFICANCE. THANK YOU FOR YOUR HONEST ANSWERS. THANK YOU FOR YOIR TIME, IT IS APPRECIATED. MAN Good afternoon Madame. My name is Mr Goodenough..
WOMAN; What an unusual name. I hope the service will be good enough. I’m so sorry. I blush, you must have heard that many a time..
MAN: Here to help you at this very important time of year. Happy Christmas. WOMAN: I want a ticket. and almost forgot there’s a` sleeper ticket, although you do not have to have either a single or double berth, just a seat in the first class. Saloon.. I have to remember to ask if the customer has a Senior rail card. Then again some trains do not stop at every station, some do Wed-Friday but not Monday. Tuesday. Thursday, Saturday, Sunday. This is an advance not an on-the-day window. MAN. That makes things a lot easier. Splendid, what I would call a Christmas gift. MAN: When you do this job you never get anything simple, like one customer and one customer only, travelling there and then, just a single ticket. No all day it’s family tickets, two for one husband and wife, school party, four for 2, zonal purchase, weekly, monthly, all-year advance purchase, then foreign parties of 20 or more, rarely get asked for one ticket. Oh, people want a parking ticket, ask for a 10p off voucher for some fizzy track, a headache. WOMAN My friend has told me that you do a supper super super single ticket. MAN: Not good enough. See I can take a little joke against myself. To where do you want to go? WOMAN. OH, how silly of me. Newtown. MAN Are you sure there’s a station in Newtown? WOMAN I meant a rail and bus ticket .. to PENZANCE. then to Newtown.. My friend says it’s the number 2 bus. MAN; Penzance, quite a journey. No 2’s are all double dekkers, not that you see much when it’s dark. Went to Penzance with Gwendoline for our honeymoon. Lovely place. Penzance. Here it is. Right. Excuse me sir, I’m still dealing with this lady. MAN: Can’t see anything ABOUT A SSUPER SUPER SUPER SINGLE OR A SUPER SUPER SUOER SUPER SUPER SINGLE . At this time of year the more cheaper tickets get withdrawn. Usually I can offer a dozen or more alternatives. There is a reduced fare – Christmas offer – for those who have suffered a divorce this year. WOMAN: Charles left in August. MAN: That’s good-enough. Did I say I can take a jest? It must be a first divorce. WOMAN: He was my fourth. I know – not good-enough. MAN. I mean if you were to go before December 22, there’s a special ticket for children, proof needed of course. MAN: All this makes it that more awkward trying to get a cheaper ticket. behind the cost of flying to New York.. One Way..
WOMAN That’s 12 hours. Simply not good enough. Oh, I am so sorry.. 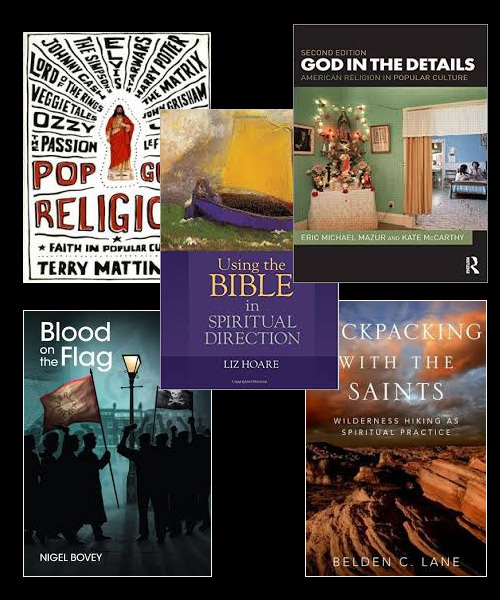 This month’s listing is of books in a theatre context that deal with Jesus..
Anon, ed. Kemp E with Mitchell, K. (1997) The Mysteries. London: Nick Hern. Bradley I. (2004) You’ve Got To Have A Dream, London: SCM. Braun. M. (1972) Jesus Christ Superstar. The Authorized Version. London: Pan. Browne, H and E.M, (1945) Pilgrim Story, London: Frederick Muller. Buckner. R. (1993) The Joy of Jesus - Humour in the Gospels . Norwich: Canterbury Press. Clarke-Smith. ( 1901 ) The Miracle Play in England, London: William Andrews . Dewar, L. ( 1949 ) New Testament Ethics,.London: University of London Press. Eversole, F. ed. ( 1962 ) Christian Faith and the Contemporary Arts, NY: Abingdon. Forde, N. (1986). Theatrecraft., London: Marc Europe. Honeycombe, G. (1964) The Redemption, London: Methuen. Hussey, M. (1957) The Chester Mystery Plays , London: Heinemann. Jasper, T. (1974) Jesus in a Pop Culture, London: Collins. Johnson T. E. Savidge D. (2009) Performing the Sacred: Theology and Theatre in Dialogue. Baker Academic. Malachi, M. (1975) Jesus Now, London: Collins. Miles, K. (1981) Coventry Mystery Plays, London: Heinemann. Moynahan. M.E. (1998) Once upon a Mystery. New York: Paulist Press. O’ Leary, D.J and Sallnow, T. (1982) Love and Meaning in Religious Education- The Incarnational Approach to Teaching Christianity, Oxford: OUP. Pickering, K. (2001) Drama in the Cathedral, Colwall: Garnet Miller. Purvis, Rev.J.S. (1953) The York Cycle of Mystery Plays, London: SPCK. Sanders. E.P. (1985) Jesus and Judaism.London: SCM. .
Sugano, D and Pickering, K. (1997) The Midlands’ Mysteries ,Colwall: Garnet Miller. Tayor.T. (1916) The Celtic Christianity of Cornwall, London: Longman, Green & Co.
Tillich, P. (1955) The New Being, London: SCM. \Vermes. G. (2000) The Changing Face of Jesus. Harmonsdworth: Penguin. Wolfe, K. (1984) The Churches and the British Broadcasting Corporation 1922-1956, London: SCM. Wood.D.ed . (1992) The Church and the Arts. Volume 28, London:.Blackwell. Wright, S. ( 2008 ) The Sounds of the Sixties, NY: Grosvenor Houks). Backpacking with the Saints Belden C Lane (Oxford).